Hey party peeps! MERRY GRINCHMAS! Have you guys seen the new Grinch movie? It’s so good and the music…DOPE! Today, I’m excited to share with you some easy GRINCH PARTY IDEAS using affordable supplies from Oriental Trading. 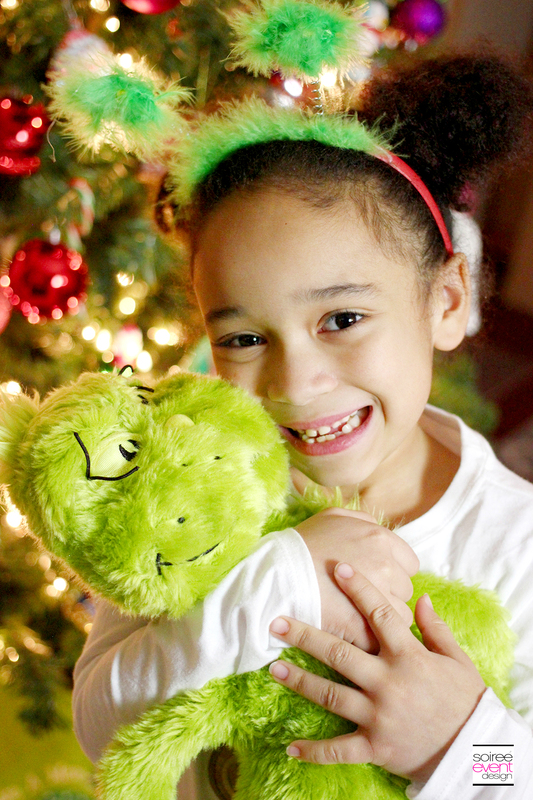 CHECK OUT THESE EASY & AFFORDABLE GRINCH PARTY IDEAS! 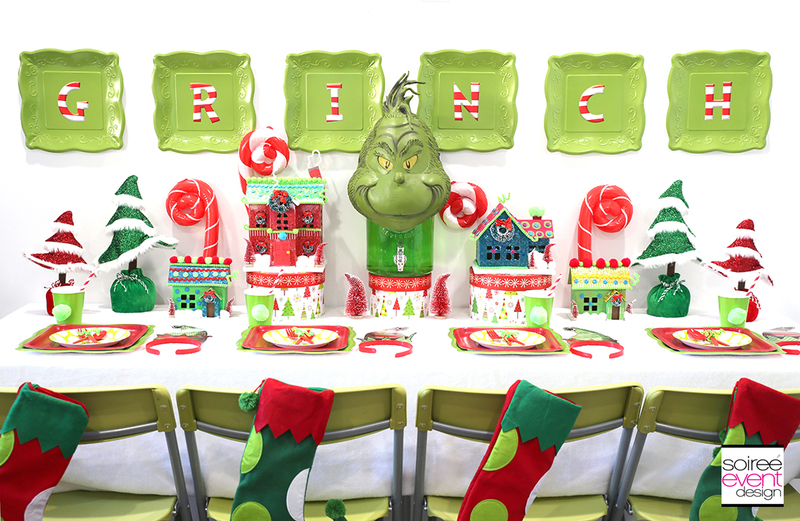 GRINCH PARTY IDEAS – CREATE A GRINCH PARTY BACKDROP WITH PAPER PLATES! Use paper plates and red/white striped letter cutouts to spell GRINCH and attach them to the wall with painter’s tape. The green square fancy paper plates look like frames hanging on the wall! Now, that’s an affordable alternative to actual picture frames! OH YEAH! GIRLFRIEND TIP: Don’t be afraid to hang the paper plates directly on your wall as long as you use painter’s tape. Painter’s tape securely holds lightweight items so you don’t have to worry about your backdrop falling off the wall during your party and when the party’s over, the tape comes off the wall without leaving any residue or damaging your walls at all! GOTTA LOVE THAT! 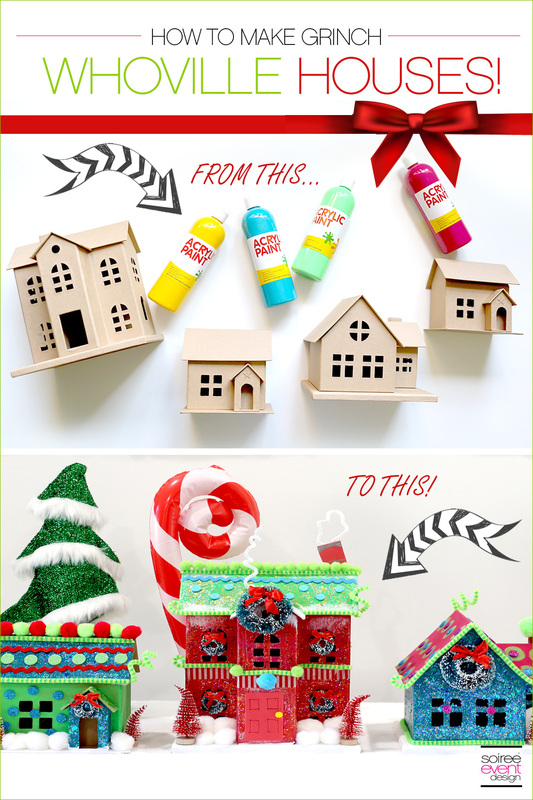 GRINCH PARTY IDEAS – CREATE A GRINCH PARTY CENTERPIECE WITH DIY WHOVILLE HOUSES! 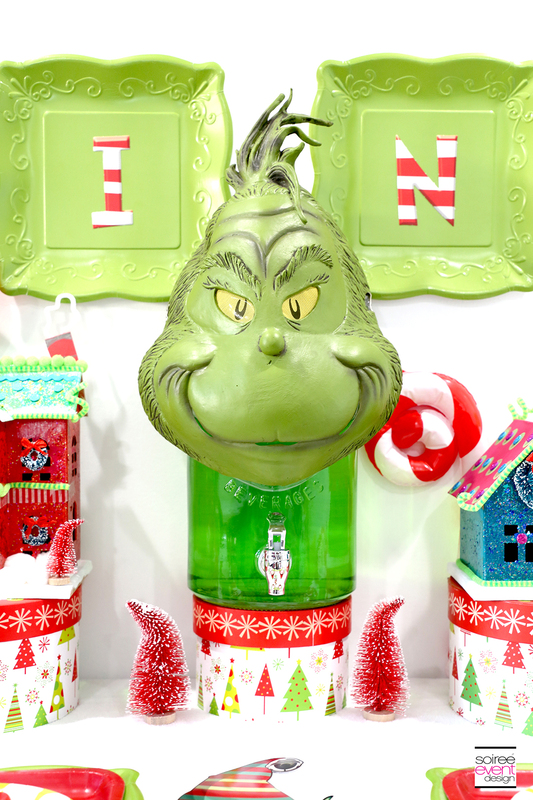 Create a stunning and whimsical Grinch party centerpiece with these DIY Whoville houses. How colorful and sparkly are these! The step-by-step tutorial and all the supplies to make these are available on Oriental Trading here. GIRLFRIEND TIP: Do this project ahead of time with your kids for a fun afternoon of holiday crafting. Me and my daughters created these houses and had a blast doing it! 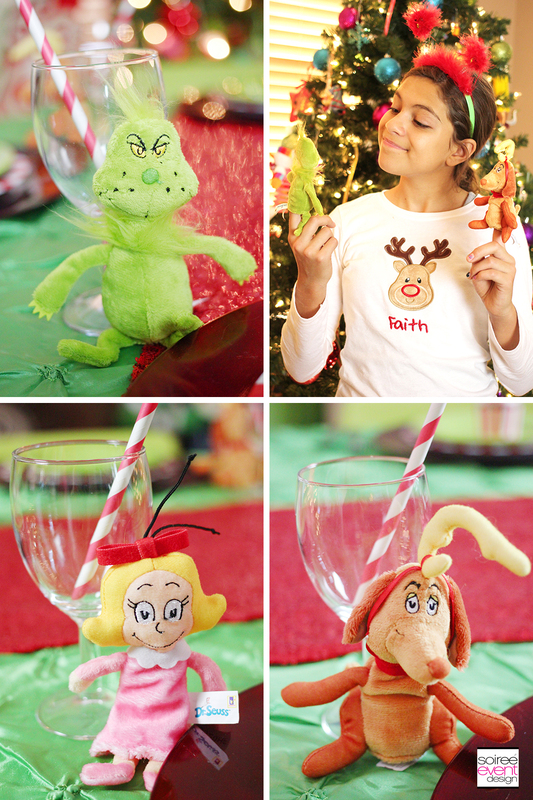 GRINCH PARTY IDEAS – SERVE DRINKS IN A DIY GRINCH DRINK DISPENSER! You won’t believe how easy it was to make this DIY Grinch drink dispenser. Simply slip a Grinch latex mask over the top of a glass drink dispenser. DONE…REALLY! GIRLFRIEND TIP: When using a drink dispenser with a spout, be sure to put it on top of a riser to elevate it off the table enough to fit your cups under it. I used to only put these on the edge of my counter at parties until I figured out that I could still use drink dispensers in the middle of a table or counter simply by elevating it! HELLO! These boxes from Oriental Trading are sturdy enough to hold the drink dispenser and tall enough to fit a party cup under the spout. 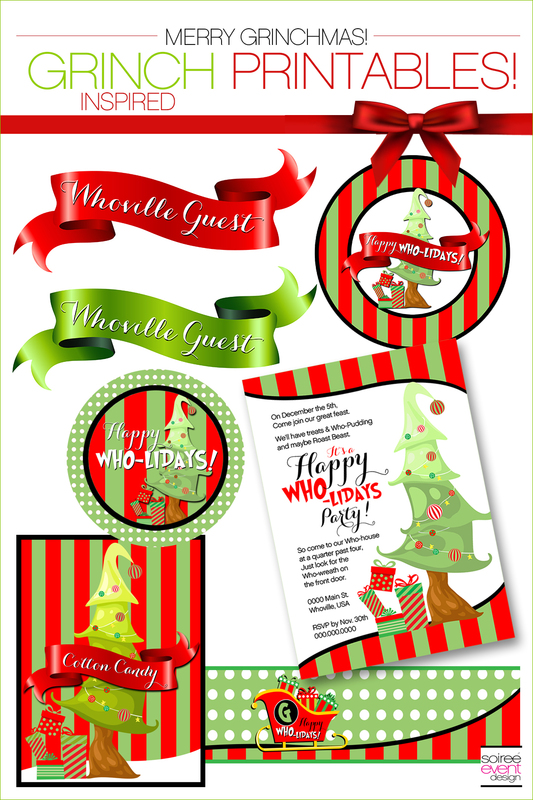 GRINCH PARTY IDEAS – USE GRINCH PARTY PRINTABLES! I designed this “Happy Who-lidays” collection inspired by the Grinch. 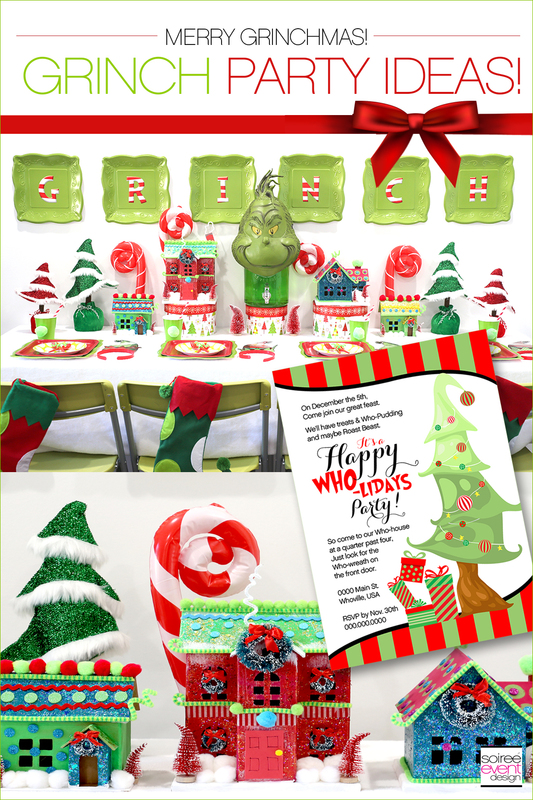 These Grinch party printables includes everything you’ll need to create a whimsical Whoville party including printable invitations, food table tents, cupcake toppers, drink wraps, scroll chair backers, signs and more! GIRLFRIEND TIP: Using party printables adds a professional look to your party for a small cost. The great thing about printables is that you can print as many of the items you need without having to reorder. 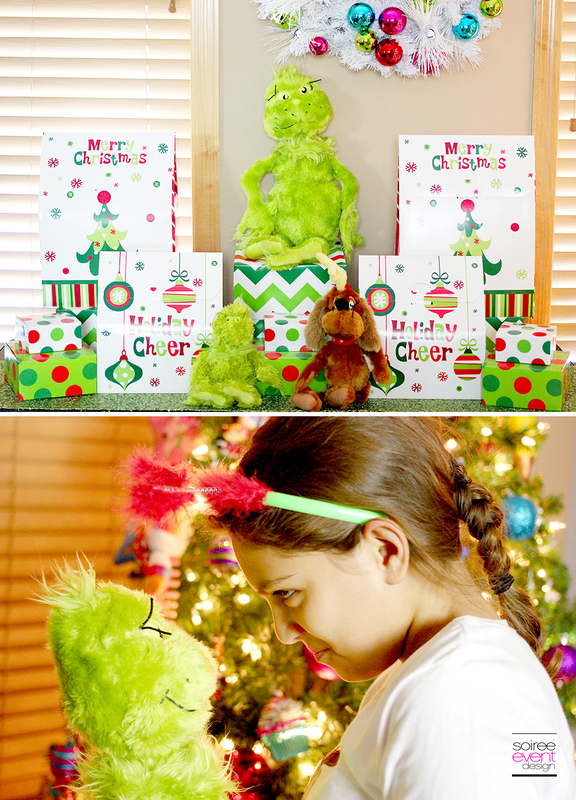 GRINCH PARTY IDEAS – USE GRINCH TOYS AS GRINCH PARTY DECORATIONS! 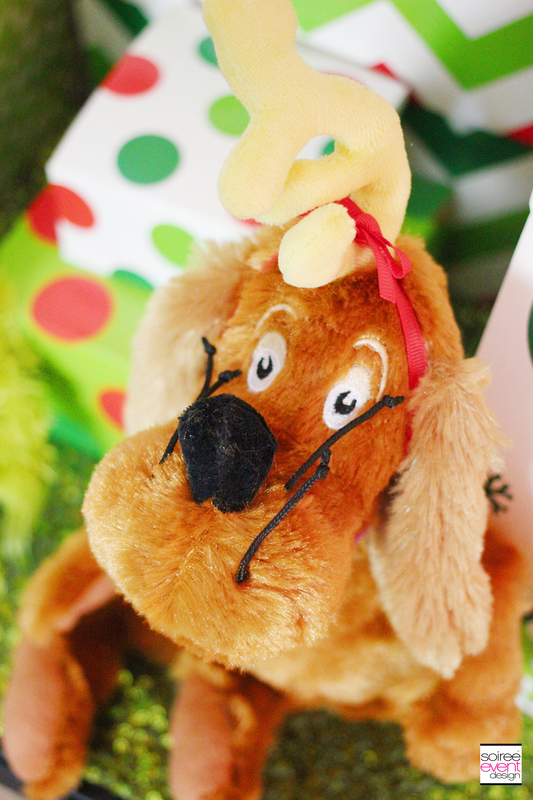 Place a few Grinch and Max toys around the party as Grinch party decorations. They make easy centerpieces for table displays like this gift table and how cute are these Grinch finger puppets that make fun party favors for your guests! Click here to see my Grinch Christmas Dinner Kids Table! GIRLFRIEND TIP: I love to use toys as party decorations and then surprise the kiddos with the toys after the party. It’s the season of giving right? I hope these Grinch Party Ideas have inspired you to host your own Grinch party this holiday season! Be sure to head over to Oriental Trading for more details and a shopping list so you can recreate this party! 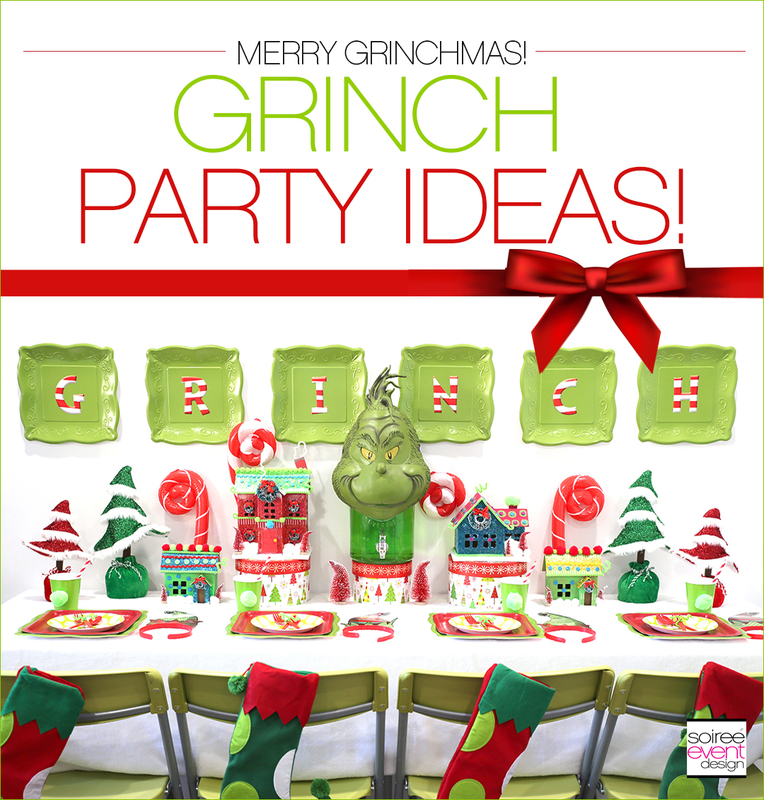 WANT MORE GRINCH PARTY IDEAS? 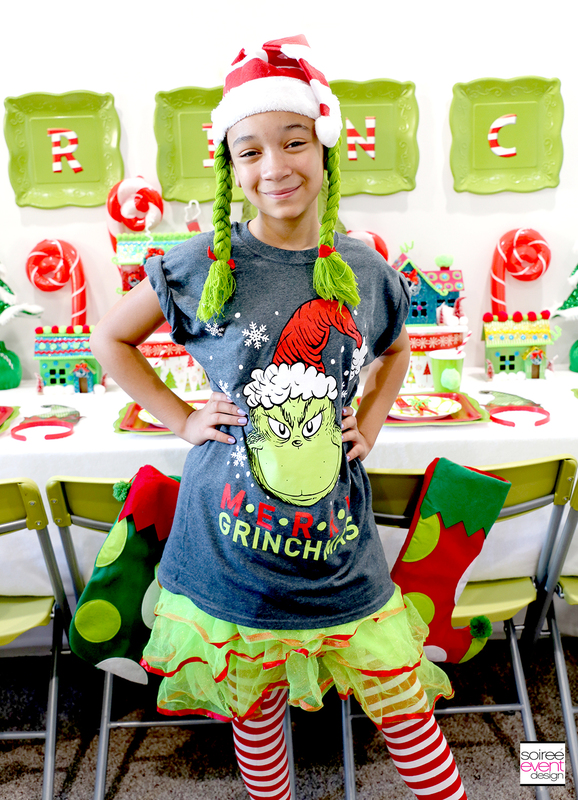 Check back this week where I’m sharing a tutorial on making Grinch t-shirt party favors and recipes for some Grinch party desserts!